We’ve all been to one, some of us probably feeling slightly jaded about being pressured to contribute a dish that will surely be outdone by that one magnificent chef that attends every celebration. But where does the tradition of the potluck come from? A common myth is that the word derives from the Potlatch feasts practiced by Native American Societies in the Pacific Northwest. But according to most dictionaries, the term originated in 16th Century England, to describe unplanned meetings in which you would eat whatever was available, perhaps leftovers from a previous meal warmed up in a pot. If you were hungry, you would have the “luck of the pot”. Of course, this is not how the term is used today in the United States. For us, a potluck is a planned event in which all of the guests are expected to contribute a dish. This different application of the term is often attributed to Native American influence. 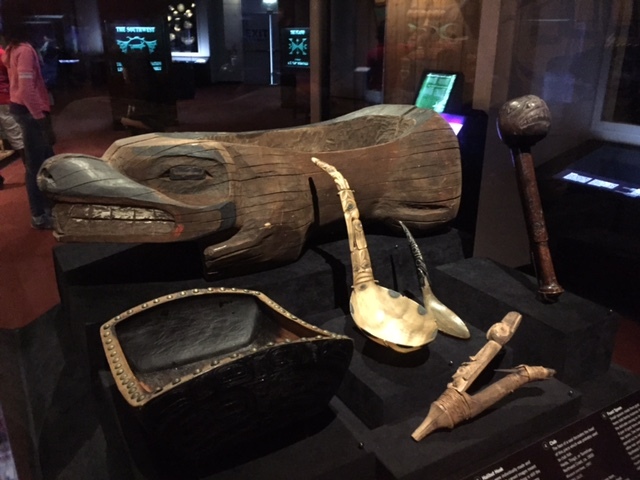 After all, potlatches were similar in that the hosts would invite guests to a potlatch and provide them with food, with the expectation that some guests—the elite ones—would reciprocate the act by holding their own celebration at a later date. The potlatch served two purposes, one was to provide the host with an opportunity to show off their wealth and status, while the other was to help determine trade relationships and hierarchies between different settlements. You know that one person who tries to out-do everyone else with an elaborate dish? Well, that’s kind of how potlatches worked. The more elaborate the celebration, the greater prestige it brought to the host. In many cases these displays could take a much more deliberate form than a little over-achieving. For example, in our McGovern Hall of the Americas we have beautiful sets of masks and capes. 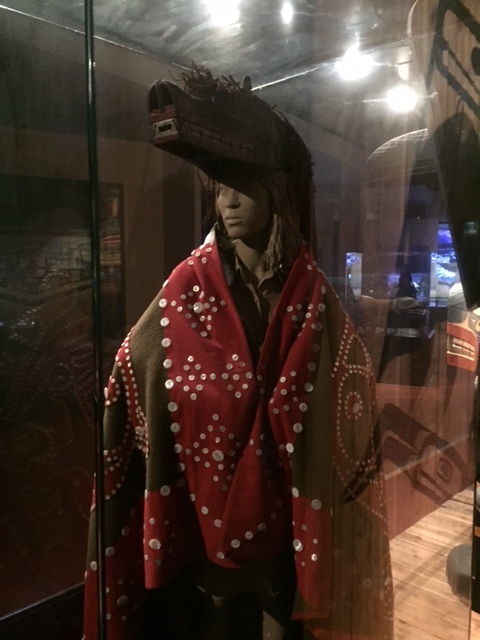 These costumes were worn during dance rituals at potlatches. The right to wear these garments was inherited though, so participating in the dances was a way of showing off your status in society. Chieftain (or “Tribal”) societies are not egalitarian, and the complex fishing societies of the Pacific Northwest had strict social hierarchies that were reinforced by these rituals. Hierarchies were so strict that in many cases one had to choose their spouse from a particular, high ranking family, like how it was in medieval Europe. Probably the most interesting form of gaining prestige was the breaking of coppers. Coppers are little flat, shield-shaped pieces of hammered copper, that acted almost like currency. Only the highest ranking members of settlements could own them, and they were extremely valuable, but their value was purely symbolic. Coppers would be traded during potlatches, sometimes enormous quantities of goods would be traded for a single copper. If a chief felt that another chief had dishonored him, he might break a piece off of his own copper in the presence of his guest. This was a great challenge, because the other chief would then be expected to hold his own potlatch and break a piece off of his own copper in reciprocity. If he could not do that, he would lose prestige. Now, does anybody recognize this sort of mentality in some of the Thanksgiving dinners they go to? It’s perfectly normal for people to desire to be admired for all they have worked hard to accomplish, and sometimes family dinners provide a setting that seems appropriate for that. Rather than impressing other village leaders, though, they just want to impress those they love. It is hard to say whether or not the American potluck tradition was really inspired by Native American feasts, because similar traditions are carried out all over the world. Next Post Our New Holiday Shopping Guide is Here!